Mammoth Lakes, California is the home of the Mammoth Mountain ski resort. The town is small and tucked away in the Eastern Sierra mountains. Mammoth is actually the east side of the Sequoia Forest and is just south of Yosemite National Park. Many visitors will venture from Mammoth to Yosemite, or nearby June Lake on day trips. To the south of Mammoth is the most famous mountain in the United States, Mt. Whitney. During winter months, skiing in Mammoth is the most popular activity. The Mammoth Mountain ski resort has the longest season of any west coast ski area starting about mid Novemeber, and most times to Memorial Day. Sometimes you can still ski or snowboard one or two runs on July 4th. June Mountain which is about 30 minutes north is also a great ski mountain especially for families that ski and ride. In spring and summer, fishing, and taking a walk or going on a hike are also favorite past times. Since the opening of the Mammoth Mountain Bike Park the resort has come full circle to become a four season resort. Mammoth Accommodations are composed mostly of rental condos and hotels. City Concierge can take care of all your needs simply and easy. We love our groups and larger events too. Most people drive. Mammoth has a commercial airport and so now you can fly to Mammoth via Horizon Airlines in both winter and summer. Los Angeles is the hub for those coming out of state, however their are connecting flights from the San Francisco area and Orange County if those airports are more convenient. 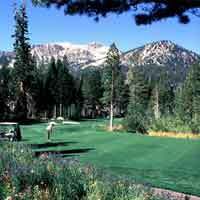 Golf is very popular in summer at Mammoth. We have 27 holes. Mammoth has a wide variety of eating options. We created a dining guide to help you navigate the over 50 restaurants in our tiny little town. From American food and simple meals, to more complex... and delicious fine dining, the town offers options for everyone. We can also send someone to cook for you! It's new, It's convenient and you get the best deal in town, ordering your Mammoth ski rentals before you arrive to avoid having to wait in any kind of line. You can also get bicycles to ride arouond town, or pick up a Mammoth Mountain bike rental to tackle the terrain park. There are street bikes available as well. We have a new bike path that goes all around our lakes. Need some pampering? We can order you personalize in room spa services and or you might want to hop into a good yoga class to help you unload your stress. We offer a wide variety of guest services including personal chefs, meals cooked to order, grocery delivery including our traditional complimentary vacation planning services. One of the hardest things while on a vacation is getting reliable child care. Need a parent's night out? We can provide you with babysitters, who we trust. As always, it is up to you to check them out so they meet your standards. Many of ours are CPR trained. Mammoth is very pet friendly. You can bring your dogs most places, but having pet friendly accommodations are mandatory. When you make your reservations, be sure the properties you reserve are labeled pet friendly. Sometimes they are hard to find, and we can help you find them. We hope our Mammoth Visitor Guide is helpful. Feel free to call us with any questions.